Thoroughbreds are known for their speed, athleticism, and grace, but unfortunately they are also known for having less-than-durable hooves. Often you'll hear the terms, “thin-soled,” “brittle” or “shelly” describing the thin nature of the layers of keratin that make up the Thoroughbred hoof, and it's usually true. While some have more issues than others, Thoroughbreds just tend not to have the same durable hoof of other breeds. Based in Central Kentucky, Scheffel's client base is about half Thoroughbred breeding stock and half riding horses, many of which are former racehorses. Scheffel estimates that about 50 percent of the Thoroughbreds he sees have a minor to moderate graduated heel, which means that one heel is more upright than the other, changing the angle of the hoof, similar (but less dramatic) to a club foot. “Within a four- to six-week shoeing cycle, their feet will grow three to four degrees out of whack. They can be hard to match,” said Scheffel. As with any horse, regular trimming is key in maintaining the soundness and overall health of the hoof, but it is especially important in Thoroughbreds. Scheffel likens it to a human wearing different shoes. Scheffel explains that shoeing a horse is a necessary evil, as shoes on a horse prevent a horse's heel from spreading naturally. Often when a horse retires from racing, two of their shoes, or sometimes all four, will be pulled to accustom the horse to a turnout schedule. Nearly just as often, they will go through hoof bruising and abscesses. King and Scheffel both believe the best way to transition a recently-retired racehorse is by pulling the back shoes first and converting the horse gradually to turnout, starting with an hour or two at a time in a small pen or paddock and working up from there. “They're used to being in a stall nearly 24 hours a day both mentally and physically, so give them gradual leisure time. It's not fair to a horse who has been babied in terms of always walking and training on manicured, dry surfaces with shoes on all four feet and fed highly concentrated feed to be turned out barefoot in a pasture all at once,” said Scheffel. King says for horses that have a harder time with the transition to turnout, she will paint their feet with turpentine in an effort to help them toughen up. One of the most common issues with Thoroughbreds, especially once off of the racetrack, is feet that have a hard time standing up to normal wear and tear. Most Thoroughbreds' feet are sensitive to moisture. 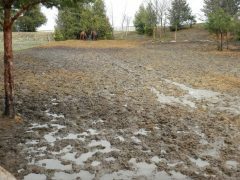 While one thinks of pasture turnout as the best thing for a Thoroughbred newly retired from racing, it can play havoc with their feet. Think about the transitions a horse's feet go through each day: his feet might start off wet in the pasture for 12 hours overnight, followed by a walk over gravel to come in. Then he may be ridden on a hard surface and hosed off, adding another one or two hours of his feet being wet before they air dry. Add to that being turned out during the day when the ground is hard and dry and the horse is stomping flies and there will be more concussive activity. That further weakens the hoof before the sun sets and the hooves stay wet for another 12 hours again. “For a horse who is working on a surface harder than he or she is turned out on, shoes provide that barrier between their hoof and the harder surface they are being worked on,” said Scheffel. Owners can help reduce the number of transitions for the foot by simply not hosing the horse more than once or twice a week, or keeping the horse in for part of the day or nighttime. Thoroughbreds' hooves are like a piece of untreated porous wood. They are going to take on moisture when they come in contact with water and will shed that moisture when they are dry, but can become overly brittle. This constant battle of wet and dry can compromise the integrity of the hoof, much like it would a piece of wood, predisposing it to cracking and chipping and making it brittle. “The best thing you can do for a horse with brittle feet is control the amount of time it is in contact with water,” said Scheffel. “Yes, Thoroughbreds are known for not having the best feet, but most of their issues can be easily managed with good planning and proactive farrier work,” said Scheffel. 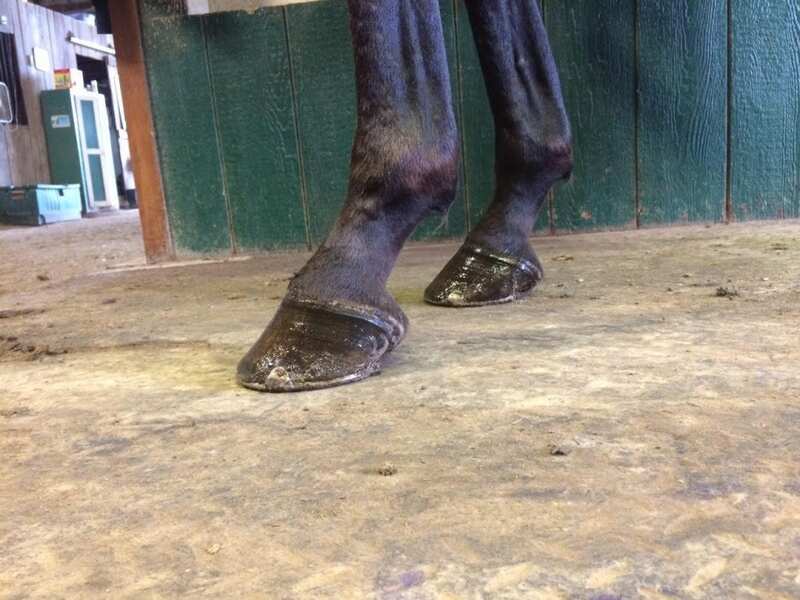 This entry was posted in Hoof Care and tagged common hoof issues, dave scheffel, farriers, hoof care, Horse Racing, thoroughbred, Thoroughbred aftercare, thoroughbred feet by Jen Roytz. Bookmark the permalink.